NARRAGANSETT - With two polling stations, the town had a higher turnout than other areas of the state. Statewide, turnout was the lowest it has been in over a decade with only 18 of eligible voters voting. Even with his own incumbency and name to run upon, David Caprio was unable to outrun political newcomer Teresa Tanzi. Both candidates spent part of Tuesday’s primary rallying supporters and backslapping voters in the Narragansett Community Center's parking lot. "It is so inspirational to see how many people have been engaged," Tanzi said. While voting in South Kingstown sputtered throughout the day, after 3 p.m. turnout intensified. By 4 p.m. voter turnout totals were higher than expected: 293 at the South Kingstown High School, 269 at the South Kingstown Fire Station, and 1,253 at the Senior Center. By 11:35 p.m. when final results were in for the heated District 34 race, Tanzi emerged victorious with 1,333 (57.8 percent) to Caprio’s 875 (42.2 percent). Tanzi will be running against Republican Timothy Burchett who ran unopposed (receiving 148 votes) and Peter J. Stone, an independent. Burchett and Stone could not be reached for comment at press time. "I'm looking to recharge," Tanzi said on Thursday. After a short but intense campaign, Tanzi will take four days of vacation before returning to prepare for the November election. "My priorities for the general election will be the same. I want to keep talking to and listening to voters. I had a voicemail full of people who are ready and willing to get to work. I also look forward to engaging in the issues and working to make this a better district - a better place to live." While Tanzi is a New Jersey native and spent several years in Utah, she says she is committed to Rhode Island. "I truly love this area. I'm deeply committed to being a voice. And I think there is a lot of opportunities to explore economic activity in a pristine manner. Opportunities that might have been overlooked." Tanzi described the "immoral" tax reform which reduced the state's top tax rate from 9.9 percent to 5.9 percent. "This was a very poor decision. We need to make a reform that canheal the budget woes," she said. 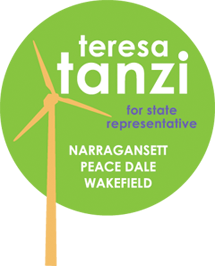 Tanzi thanked supporters Tuesday night in a crowded and energetic gathering at Kabuki Bistro in Wakefield. Toppling a Caprio in Rhode Island is big news, especially in 2010 as David's brother, State Treasurer Frank Caprio, readies for a gubernatorial bid against Republican John Robitaille. David Caprio began serving as an elected representative in 1999 and throughout 2010 was the House Chairman of the Judiciary. Previously, he had served on the Committees on Corporations, Labor, and the House Committee on Finance. Both Caprio and District 68’s Douglas Gablinske were defeated with the help of union organization -which might explain the high turnout in an otherwise slow state primary.